The nerves of the leg and foot serve to propel the body through the actions of the legs, feet, and toes while maintaining balance, both while the body is moving and when it is at rest. Sensory nerves are of course present throughout the lower extremities; however, with the exception of the bottom of the foot, they play a lesser role here than in the upper extremities. Primarily, this section of the peripheral nervous system sends and receives signals regarding locomotion and balance of the body. One of the body's largest and longest nerves is the sciatic nerve. It descends from the sacral plexus through the buttocks and into the thighs to supply nerve impulses to and from the muscles and skin in the hip joints and thighs, the lower legs, feet and most of the skin below the knee. 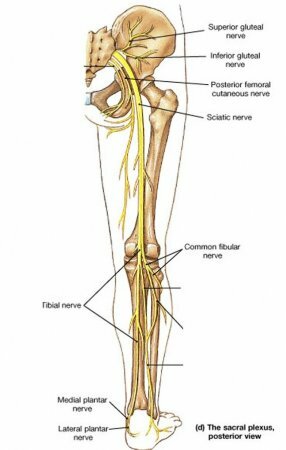 Along its route through the legs, the sciatic nerve splits into the tibial and common fibular (peroneal) nerves, which in turn split into many smaller nerves in the legs and feet. The nerves of the foot help move the body and keep balance both while it's moving and at rest. 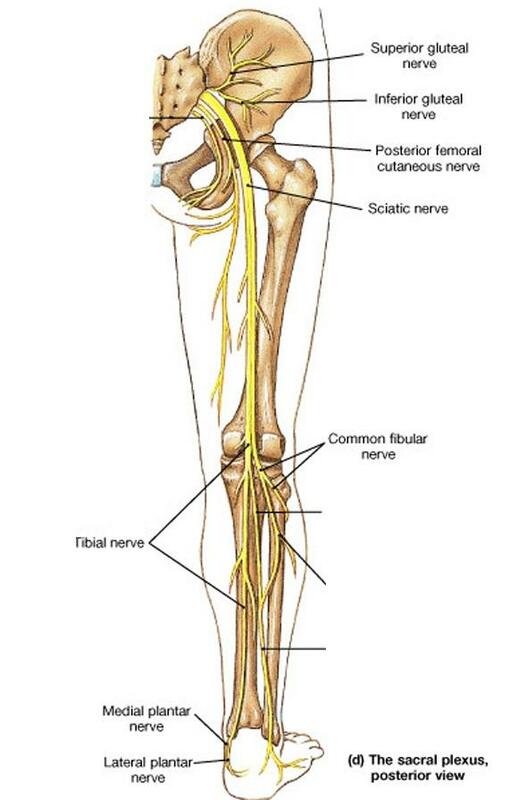 All of these nerves extend as branches of nerves in the leg that pass through the ankle and into the foot. The sural nerve branches from the tibial and common fibular nerves and is responsible for feeling on the outside of the foot and the small toe. The medial and lateral plantar nerves are the two largest nerves in the bottom of the foot. Working together, the plantar nerves command the many small muscles of the feet and toes to create the constant, subtle shifting of the feet that keeps us from falling down. At the same time, these nerves deliver messages to the brain that bring information about the angles and position of joints, the length and tension of muscles, or even the speed of movements so that through the interaction of the nervous system with the muscles of the lower extremities, balance may be maintained.